With Grohe Concetto, you can combine the magnificent of flowing curves with cylindrical bodies that transform your bathroom into a warm temple of well-being. Due to the fusion of round bodies/items and straight surfaces, the faucets do not only appear in an extravagant look, but also give your bathroom a special charm. 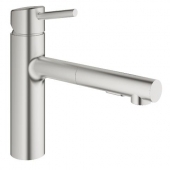 with chrome furface, kitchen faucets also in "supersteel"
The washbasin faucets of the product line Concetto are mostly free-standing single lever washbasin faucets. These are available in sizes XS (139 mm), S (152 mm), M (190 mm) and L (301 mm right-angled design and 291 mm round-curved design). There are two projection variants: 60 and 66 mm. The L variants have a different form than the other sizes, such as longer thin outlet which is bent at round or right-angled. The lever is attached to the side of the base body and the outlet is rotatable. 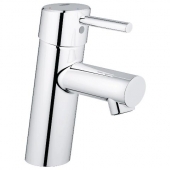 L size faucet is also available as a three-hole basin mixer. In addition, a two-hole washbasin faucet for wall mounting is also offered. 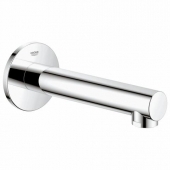 The bidet faucet is similar to the washbasin faucets and also has a ball joint aerator that takes up the round shape of the entire line. 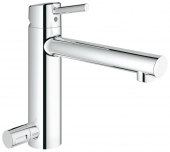 The Concetto product line offers two single-lever shower mixer for surface and flush-mounted installation The control lever is round with a long narrow rod. The flush-mounted version sits on a round rosette. 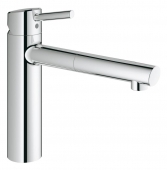 The surface-mounted faucet consists of individual cylindrical and flat round components. The Euphoria Concetto shower system for wall mounting can be also selected as a complete set. 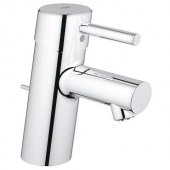 It consists of a head shower, a hand shower and a single-lever mixer. In addition, the Grohtherm 1000 Cosmopolitan thermostatic battery (also available for bath) can be combined with Concetto faucets. Concetto has a bath spout in the assortment, which can be combined with one-hand bath mixer (flush-mounted). 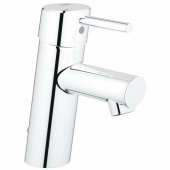 In addition, one-hand bath faucets are offered for surface mounting with and without hand shower. This hand shower is then mounted separately with its own bracket. 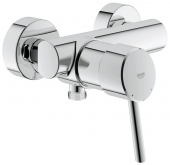 The version without hand shower can be combined according to individual preferences or an existing one can be used. Concetto also offers a practical shelf for this bath faucet, which is attached to the top of the faucet and for shower gel, shampoo or other shower utensils to be placed on. 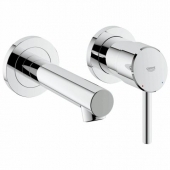 The assortment is rounded off by the four-hole single-lever bath combination for the tub rim with hand shower, inlet, diverter and single-lever handle. 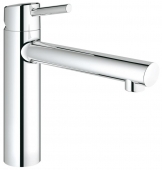 This type of faucets always represents an exclusive look and fits in any modern bathroom. Many of the bathtub faucets have practical Grohe technologies and functions such as an automatic diverter between the bath and shower, a smooth rolling SilkMove cartridge and the EcoJoy water-saving technology, which makes water consumption never exceeds 9.5 l / min. 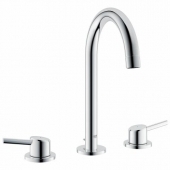 The three design options ensure individuality in which the kitchen faucets are offered: in the form of washbasin mixers with longer spout and higher base. The spout can be attached below the lever and directed straight forward or set low and tilted upwards. The third design option has a thin, rounded spout that can be swiveled through 360 °. In some cases, a pull-out spout and a spray function are also integrated. An extraordinary option is the kitchen faucet with a mixer taps as you know it from shower or bathtub faucets. 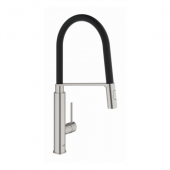 This brings variety into daily kitchen life and you get a kitchen faucet that not everyone has in their kitchen. In addition to the chrome version, the kitchen mixers are also offered in “Supersteel” color. On Grohe homepage under the category BestMatch, suggestions for suitable washbasins are shown. 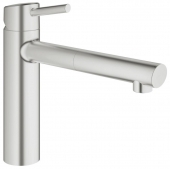 For this one, Concetto faucets were combined with washbasins from various manufacturers and tested for ease of use and splash characteristics. Furthermore, the recommended combinations look good together. Accessories from Essentials series can be combined. Here you will find many practical items for the bathroom, such as grip handles, soap dispensers, toilet paper holders and towel rails. The accessories take up the round shapes of Concetto and bring variety into the bathroom through many selectable surfaces such as cool sunrise, nickel and warm sunset. Here you will also find complete sets with several accessories to make your choice easier.